October | 2012 | Breathe. Sweat. Smile. Yoga By Degrees is opening its second location bringing to the Village of Western Springs the first hot yoga studio in the area and inviting the public to take a first look inside. After getting a successful start in Wheaton nearly two years ago, the owners of Yoga By Degrees set out to find a second location in an area that they felt could benefit from a Hot Yoga Studio. Heat during yoga practice has numerous benefits. It allows for a deeper cleanse of the body and boosts the body’s circulation. It also loosens up the muscles and detoxifies the organs and allows for greater range of motion in joints, muscles, ligaments and other supporting structures of the body. Besides that, heat has a calming affect on the mind and when the mind slows down and the heart rate picks up you have the perfect combination for a yoga practice. Yoga By Degrees classes are heated from 80º F to 105º F and classes range from beginner through advanced levels. The public is invited to come take a look at the heated yoga studios, sign up for a free week of yoga, meet the teachers and enter in a raffle. There will also be food, refreshments and much more. The Open House takes place at Yoga By Degrees located at: 4700 Gilbert Ave., Western Springs, IL 60558 from 10 A.M. – 4 P.M. on Saturday October 20th. and 12 P.M. – 4 P.M. on Sunday October 21st. Classes start Monday, October 22nd. Visit: http://www.yogabydegrees.net for more information and a complete schedule of classes for both the Western Springs and Wheaton locations. Each morning the Yoga By Degrees Instructors lead the builders through a series of standing yoga postures that lasted about 15 minutes to help increase their flexibility, strength, balance and focus before they started building for the day. Organizers and Volunteers say they were extremely grateful for YBD’s participation. The 2012 DuPage Habitat for Humanity “Women Build” program engaged a diverse group of women to assist in the construction of a group of 12 sustainable own homes. The construction is taking place in Glen Ellyn, IL in the Prairie Green Subdivision located just North of Rt. 53 and Butterfield Rd. The Women Build program took place on Thursdays and Saturdays in September, 2012. We have been so inspired by all of our students thoughtful intentions! 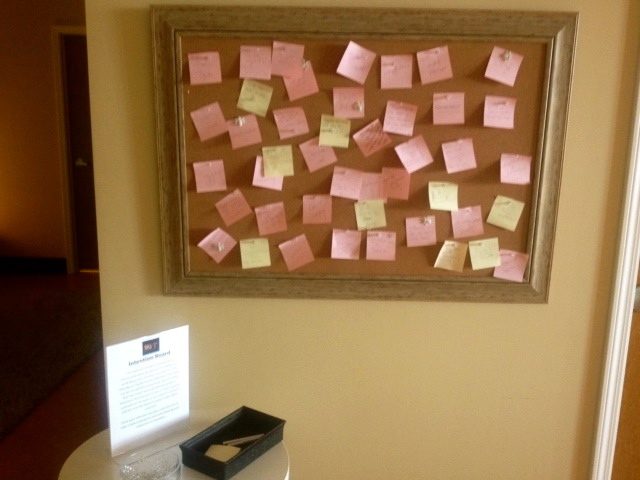 We had been planning to install an intention board at our Wheaton Studio for months but never expected the kind of response we have received in just a few weeks of it being active! YBD students have been writing down their intentions for class, the day or the year. The board allows everybody to be anonymous and in addition to any intentions, write down any quotes that might inspire them or inspire those who pass it by. If you are one of the dozens of YBD students who has already left a post it on the board, we thank you for inspiring and helping to build our community!